Since March 5 drops of water trickle from the foot of the crucifix, close to Our Lady of Velankanni (Mumbai). A Hindu woman discovered the alleged miracle. President of the Indian Rationalist Association accuses the Church of exploiting the sacred images and the pope of being anti-science. Auxiliary Bishop of Mumbai: "Statements fruit of his own ignorance. He must apologize. " Mumbai (AsiaNews) - "It is fair to ask whether the case of Irla is truly a miracle. It is impermissible to accuse the Church of creating similar events to make money", says Msgr. Agnelo Gracias, auxiliary bishop of Mumbai, responding to the statements of Sanal Edamaruku, president of the Indian Rationalist Association, on the alleged miracle that has occurred near the church of Our Lady of Velankanni, in Mumbai. 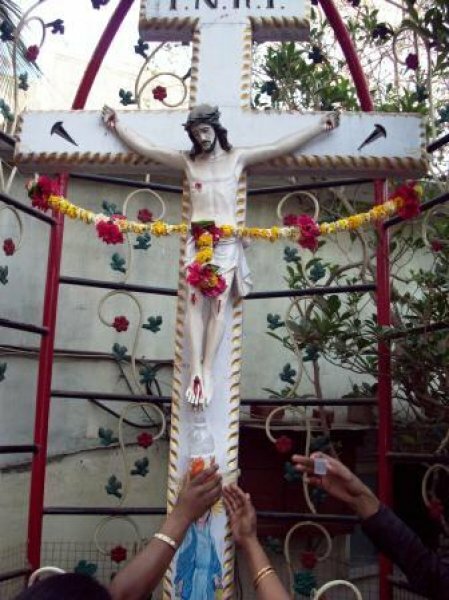 On the morning of March 5, a Hindu woman went to the cross of Irla to pray, when she noticed water tickling from the foot of the crucifix. She immediately alerted her neighbors, and for days dozens of people of every religion have gone to pay homage to the supernatural event, praying, lighting candles and collecting some of the water to bring home. Speaking to local television, the president of the Indian Rationalist Association has accused the Church of exploiting the worship of images, and of "creating the miracle" to make money, finally, he also accused the pope of being anti-science. Edamaruku then personally visited the site, arguing that this water was just a "capillary phenomenon", explained by elementary scientific concepts. The Association of Concerned Catholics (Aocc) condemned the man for the defamatory statements against the Church and the pope, demanding an official apology. In comments to AsiaNews Fr. Augustine Palett, PIME (Pontifical Institute for Foreign Missions) and pastor of Our Lady of Velankanni, said: "Something has happened here that is beyond our understanding and that has gathered together Hindus, Muslims and Christians, united in prayer. Sanal Edamaruku's statements are unwarranted, unfounded and false. The Church does not try to make money from people's devotion. Its institutions relentlessly serve poor and marginalized, without any discrimination of caste or creed, to build this nation. " In a statement, the Auxiliary Bishop of Mumbai said: "The Church is always cautious in attributing supernatural causes to out of the ordinary phenomena. Whenever possible, it always tries to find 'scientific' explanations for similar events. It does not pay great attention to things like this, although it accepts the possibility that God can intervene in human life in 'extraordinary' ways: what we call 'miracles'. " Responding point by point to Sanal Edamaruku's allegations, Msgr. Agnelo Gracias states: "The Church does not advocate the worship of images we honour them. We respect and honour the Scriptures of any religion not because the books are in themselves divine, but because they have a special significance for the adherents of that religion. We honour a cross because it is for use as a reminder of the love of Jesus who died for us. The Irla crucifix does not belong to the Church, and it was a Hindu woman, not a Catholic, to notice the drops of water. " Finally, he adds, "the pope has nothing against science. There are eminent Catholic scientists and Catholic scientific institutions, like the Pontifical Academy of Sciences. I believe that the interlocutor has made these and other unwarranted statements out of ignorance." The journal "Science" investigates false claims of cloning "pioneer"